Summertime in Tokyo! Not the best season for woodblock printmaking, but this year's schedule doesn't allow for any leeway - with a print going out the door every two weeks, the work goes on, no matter what the thermometer says! This issue of Hyakunin Issho is quite a mixed one: we have a Collector Profile and another pair of David's Choice prints, and accompanying these is a feature about recent new additions to my internet website. Sadako will round off the issue with another of her little stories, but before that, I think we'll all take a walk together! I live in Tokyo. Yes, I know most of you know that 'fact', but I wonder if you quite understand what it means. 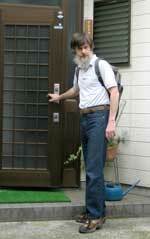 A bit of research tells me that the population of Tokyo proper currently stands at more than 12,000,000 ... all my neighbours in Tokyo! So I'm sure you can imagine my local environment ... Or can you? I thought it might be interesting to take you along while I took a walk one recent morning, so I put a camera into my little pack, along with a drink and a snack. Let's go! Just around two or three minutes after leaving, we are at the entrance to the wooded hills behind my home. It's still early in the morning, so it's still pretty cool in there, but it should warm up a bit as I go along, I think. My home is at an elevation of 180 meters above sea level; these hills run to around 300 meters, so we're not exactly climbing mountains here. 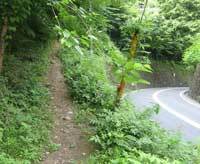 But the slopes are steep in places, enough to make one catch one's breath a bit. These pathways are generally accepted to be 'public right of way', but of course every inch of land here is owned by somebody. Back a generation or so ago, this land was used just as intensively as the flatter ground down below. Every possible flattish space was cleared for growing food, and all the slopes were 'tree farms', with cedar trees lined up in strict rows. All that has changed now; the fields up here were abandoned long ago, and the tree farms are going the same way. Here and there you can see a zone that is still being maintained - the trees properly thinned out and neatly trimmed - but for the most part, these woods are in very poor condition. 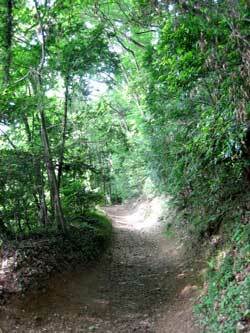 And then, we enter the upper reach of the Onita River valley, Tokyo's hidden 'Shangri-la'! This valley is the site of a failed property development attempt in the years after the war. 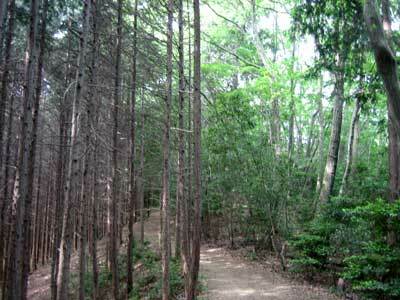 I am told that the entire place was logged off to supply lumber desperately needed for rebuilding at that time, but that a proposed subsequent housing development was scotched partly due to concerns about Tokyo's water supply (one of the main water 'intake' points is on the Tama River just below this valley). So the valley was just left as it stood, stripped of its woods, and fenced in by the real estate companies. That was more than 50 years ago, and what a wonderful place it has now become! 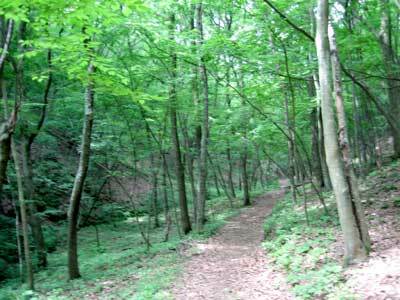 The natural forest that grew up is now in a mature phase, and thanks to the brush gathering activities of the villagers who live near here, is in places a most pleasant place to stroll, totally unlike the dark and gloomy untended cedar forests we saw earlier. A few farmers live and work along the river bottom, but for the most part, the valley is quiet and undisturbed. 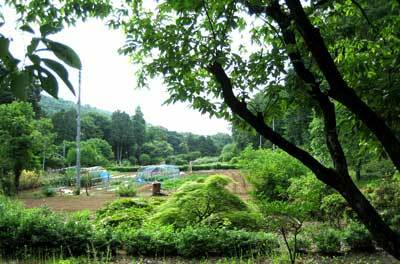 I have no idea about the future plans of the real estate corporations who own most of it, but as Onita has in recent years become quite a focus for citizen environmental groups, perhaps we may hope that it stands a chance of preservation. 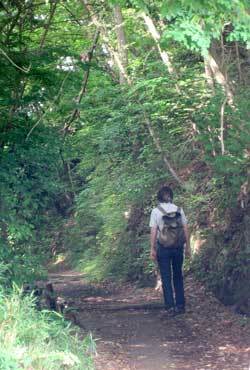 To continue our walk, we go back up to the ridge, which over the next half-hour or so of strolling, gradually slopes down towards the Tama River at the mouth of the valley, where we can no longer avoid 'civilization' - coming out onto the main road that runs there. And in fact, rather than avoid it, here comes a most civilized thing indeed - a bus that will take us back home! Back home just about exactly four hours after setting off ... Time for lunch and then a short nap, before getting on with today's printmaking work! I hope you have enjoyed this little stroll around my 'neighbourhood'! It's not too often that somebody needs to wear a helmet to come to my exhibition, but this past January, when Jeannette Ohmae came by one day accompanied by 4-year old grand-daughter Ryone-chan, I was a bit surprised to see just that - a white cycle helmet. It turned out that they hadn't come by train or subway like probably every other visitor, but had ridden their bicycle across town all the way to Yurakucho from over near Yotsuya. Now that's a method of transportation I can appreciate; I can't count the miles I must have travelled with a little one in the back seat behind me! This choice of transportation certainly isn't the only thing you could find that sort of 'links' Jeannette and I, and I think it might be possible to write a story like this in which her name and mine could be interchangeable! 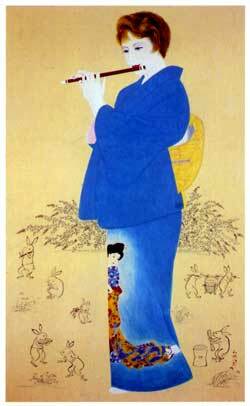 I knew from the start that the word 'flute' would soon pop up in this story; as you can see from the accompanying reproduction of a nihon-ga painting by Waka Ishida, the 'yoko-bue' is a major focus of Jeannette's interest. 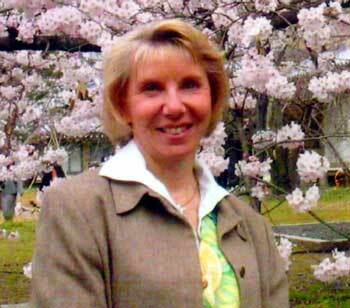 She has studied the instrument with a succession of Japanese teachers, attaining a high level of skill. As I sit writing this story this evening, I am listening to a CD of hers that she lent me, which features her duets with a Chinese pipa player. When I return it to her later, I will do so with a comment that I think it should be released commercially so that a larger audience can enjoy this interesting music! I am sure that - just as with traditional Japanese printmaking - there would be wide interest in it from all corners of the planet. There is a wide and open room in Jeannette's home, and it seems that this space becomes the venue for salon concerts on occasion; she showed me another disc recorded there recently, this one including also Danish musicians. There is a long tradition of holding musical 'soirees' in one's home in the West, and it is gratifying to see that the practice is continued today, even in this electronic and video age. For a group of friends and family to gather and make music - and at a professional level - is a pleasure which my own solitary work doesn't permit. (And after hearing these discs, I'm starting to think that perhaps she should be starting her own - @home - record label!). Jeannette came to Japan sometime before I did; her children grew up here and now, like my own, are young adults building their own lives. It was interesting to chat with her and compare our experiences; neither of us is quite sure whether or not we were able to navigate the 'best' path for our children among all the many language and education options open to bi-cultural families such as ours, but it seems that we probably made it through alright ... time will tell! But I've saved the best part of this story for the last. At least it was the best part for me! When I visited her home to talk about ideas for this little story, I hadn't been there more than 60 seconds before I found myself sitting at a beautiful wooden dining table with a cup of fresh coffee and a bowl of 'fresh from the oven' hot apple crumble before me. Talk about making somebody feel @home! Thank you very much Jeannette - of course for the support of my work over many years now, but also for being another person who is helping to show that Westerners are completely capable of developing deep understandings of Japanese traditional culture. This is another item that leaves me just speechless in amazement. 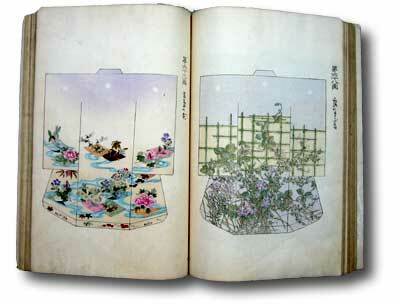 It is a catalogue of kimono designs, presumably sent by the manufacturer to kimono shops so that potential customers could see the available selection. In those days, mechanical colour printing was still in relative infancy and it was not possible to create attractive reproductions of items for which colour accuracy was important. 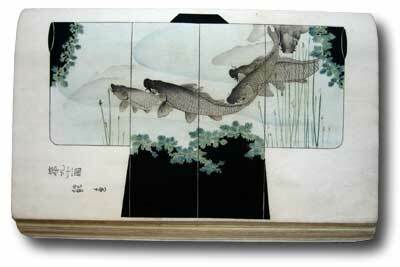 But the woodblock technique is capable of an exquisite level of subtlety, certainly equal to the task of expressing the nuances of a selection of kimono designs. Producing a book like this must have been quite a tremendous job; many of the pages required quite a large number of colour blocks to be carved, and of course the printers must have made a large number of copies of each image in order that the catalogue could be distributed widely. So a book like this is definitely not the product of a one-man workshop like mine (or even two-man: carver and printer). Teams of men must have worked together to produce it. But I sure don't get much done! This is one page from the 16-volume woodblock printed work known as the '10 Bamboo Studio', originally created in China in the early 17th century, one of the world's earliest examples of colour printing. I was browsing in the bookshops of the Jimbocho district of Tokyo with my daughter Fumi when I caught sight of a box full of scattered scraps of old paper tucked away on a shelf. I pulled it closer to inspect the contents and as I turned over some of the sheets had one of those heart-stopping moments that we so long for when visiting such dusty places. I knew right away what I was looking at - a stack of sheets from the famous '10 Bamboo' book, something I had only ever seen in book illustrations, never in real life. I knew enough to understand that these scraps weren't from an old Chinese edition, but were almost certainly from the mid-19th century Japanese printing, so it wasn't a 'million dollar' find, but it was rare enough to get me plenty excited! Fumi couldn't understand my excitement, and when she saw that I actually intended to buy the box and its contents, wasn't too pleased with me. 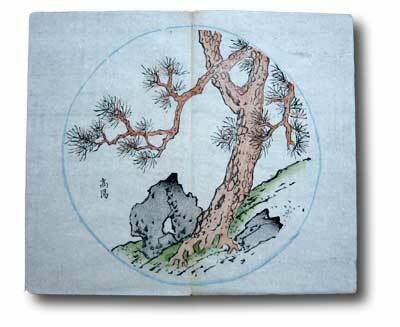 When we got home though, and I showed her some references on the book, explaining how the 16 volumes were structured: one on bamboo, one on stones, etc., she got interested in solving the 'puzzle'. 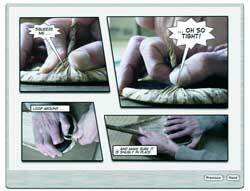 She shut the cat out of the room, spread the sheets all over the floor, and set to work to reconstruct the book. She did a wonderful job, even matching up worm holes to figure out which pages should be adjacent, and after many hours of work, presented me with the reassembled set of volumes. It turned out that we had about 80% of the original, quite a bit more than I had expected when looking at the scraps in the box. Maybe one day I'll find a neat and clean complete copy, but until then, this one will have to do! More David's Choice selections next time! My internet website has in recent years really become an important part of my life. When I first started it eight years ago, it was kind of an adjunct, but it has gradually turned into quite a 'work' in its own right. And indeed, more than half of my current collectors have come to me via the net; my little printmaking 'business' is truly a global endeavour! 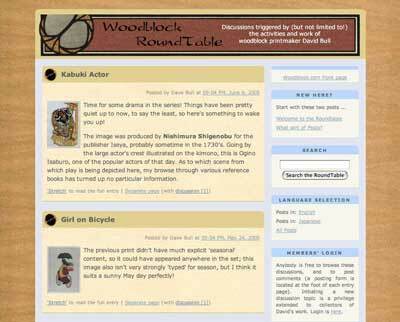 And now, as though there wasn't enough material on the woodblock.com website to keep you occupied, I have introduced a major new section: the Woodblock RoundTable! Any number of times during the years that I have been sending my prints out to collectors I have been asked such questions as 'What kind of people are collecting your prints?" or "I'd like to hear what some of the other collectors think about this print ..." It seems that many of the collectors have a fair amount of curiosity/interest in what others are thinking, so to help further this type of communication, I have created the RoundTable as a place where people can post comments/thoughts about my printmaking work. What I suspect will become the main 'thread' is a kind of feedback on the prints I send out. I don't intend that the RoundTable should be a forum for "Great print this time Dave! Thanks!" kind of stuff. I like to see those in my email of course, but they are obviously not of interest to anybody else. But almost without exception, each time I send out a print - along with its accompanying story - I get emails from collectors asking ... telling ... challenging ... questioning ... etc. some point or other to do with the print, or what I wrote about it, so I think the potential for interesting discussion and exchange is quite good. So each time a print goes out to collectors I will also post the story and image on the RoundTable, thus providing a way for the collectors not just to reply to me with their comments, but to share thoughts and ideas with each other (and whoever else might wander in to browse). 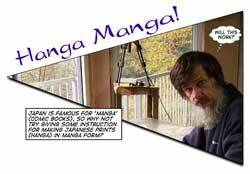 Japan is famous for 'manga' (comic books), so I thought it might be interesting to try giving some information on making prints (hanga) in manga form! I certainly can't draw something like this, but by using photographs of the process, and some comic software on my Mac, it's possible to make an informative and entertaining presentation. When I was busy raising my children many instruction books for use by parents were published; so many baby boomers were doing the same thing together. Given this trend, I was not so happy to hear about books that dictated simplistic theories of child care, ignoring the fact that each child has its own character and each one is different. When caring for a child, there may be times when a light spanking is necessary, where on another occasion you may have to explain something patiently over and over. And any child will have varying moods, such that you have to find the best path at any moment according to the situation. It is basically not advisable to become emotional when scolding a child, but there must be times when you are allowed to show your anger or weakness. Because I had such attitudes, some people might have thought that I had no consistency towards bringing up my children. How about David? I have no knowledge of their life when his children were small, but as far as I have been able to observe, he was a fond father, and always treated them like good friends. It seems that he maintained quite a flexible attitude towards their upbringing. But he was very consistent on one particular point - he never gave into them if they greedily demanded things in a childish way. Once he said 'No', they knew that there was no way to change his mind. Maybe this was an 'iron fist in a velvet glove'? In both our cases, all of our children have grown up and become (or is about to become) normal decent members of society. Looking back, I think that we probably owe more to our childrens' inherent sense than to our efforts as parents. The Japanese saying 'A child will grow up even without any parents ...' comes to mind. I am now in the latter half of my life and find that things are not so clearly defined as they once were. As I live longer I can see things from other points of view, and this sometimes makes it difficult to reach a conclusion. But also, and this especially recently, general morality and the way to judge social values have dramatically changed. I often think that I am very lucky living in a society where I can behave with more freedom, but this is somewhat scary, as without the stable anchors once present, we need to have our own firm values ... and this consistency can easily grade into stubborness. While the two of us were talking about these things, he said, "As we get older, if I start to become too stubborn, will you please let me know?" Well Dave, it's starting to get there ... But by the time you are too far gone that way, I too will be losing my own flexibility; will such a person be able to find a way to have any influence on you? I doubt it!